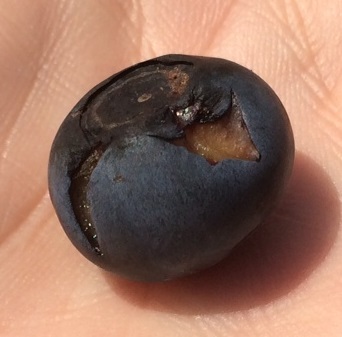 The 2016 Mississippi Blueberry Educational Workshop will be held in Hattiesburg on January 14, 2016 from 1-5pm. Several topics will be covered including mechanized harvest, Farm-to-School, Social Media marketing, blueberry cultivars, and disease control basics. Everyone with an interest in blueberries is invited to attend. See the information below for details on the program. Below is a video from Mississippi Public Broadcasting (MPB) and their program Mississippi Roads. This video is about the Mississippi blueberry industry. I even have a short cameo. I was fortunate enough to be involved in the blueberry portion of the filming. Look for me (and some other blueberry folks) on October 16 at 7pm. For more info, read below. The newest episode of Mississippi Roads features the Blueberry Jubilee held in the south Mississippi town of Poplarville and Extra Table, a philanthropy founded by renowned Hattiesburg chef, Robert St. John. The episode will air Oct. 16 at 7 p.m. on MPB TV.Mississippi Roads gets a taste of Poplarville at its 31st annual Blueberry Jubilee. More than 10,000 people flood downtown Poplarville every year for the festival. Visitors make the trip for the arts and crafts, storytelling, live entertainment and, of course, the amazing food they can only find at the jubilee. The proceeds of the Blueberry Jubilee provide grants to fund programs and projects that serve the community.Next, Mississippi Roads pulls up a chair at chef Robert St. John’s Extra Table. Extra Table is an organization that focuses on reducing the prevelance of food deserts and hunger in the state by stocking food banks and soup kitchens with healthy food. In 2009, St. John received a call from a local food bank asking him for help—the food bank’s shelves were empty and 800 families needed food. So, St. John contacted Sysco, his restaurants’ food distributer, and delivered enough healthy food to stock the food bank and feed the 800 families. This got St. John thinking. “What if every restaurant and home had an extra table to serve people in need? What would that look like?” said St. John. In order to address the severe food insecurity problem facing his community, St. John partnered with Sysco and by 2011, Extra Table was delivering new healthy and nutritious food to agencies at below wholesale prices on a regular basis. “Extra Table receives donations from private companies and individuals—100 percent of all donations go towards buying healthy food which we deliver directly to agencies keeping their shelves filled,” said St. John. Extra Table cuts the food costs of the agencies it serves significantly. This enables the agencies to allocate those funds to programs that serve the community in other ways. “The money that was going towards buying food is pumped directly into the community. The agencies use that money to provide things like after school programs and career prep workshops,” said St. John. For more about the Blueberry Jubilee and Extra Table, tune in to MPB TV on Oct. 16 at 7 p.m. for Mississippi Roads. Mississippi Public Broadcasting (MPB) provides instructional and public affairs programming to Mississippians through its statewide television and radio network. MPB enhances the work of educators, students, parents and learners of all ages by providing informative programming and educational resources. MPB’s locally-produced programming focuses on the people, resources and attractions that reflect Mississippi’s unique culture and diverse heritage. Children’s television programs constitute a major portion of the daytime and weekend morning schedules. MPB provides a valuable resource to Mississippians in disseminating information as part of the state’s emergency preparedness and response system. Since 1970, MPB has won over 400 national, regional and statewide awards, including Emmy®, Edward R. Murrow and Parents’ Choice Awards. For more information on MPB, its programs, mission or educational resources, please visit www.mpbonline.org. 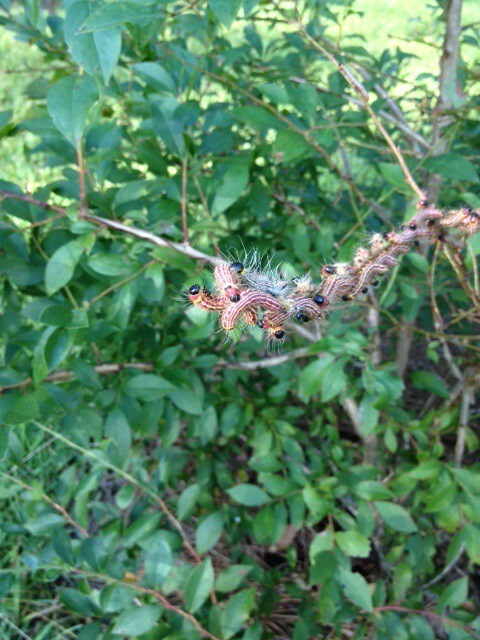 The Walnut Caterpillar (aka Walnut Datana) (Datana integerrima) is a common pest of pecan trees. The adults are moths with light-brown wings marked with dark-brown, wavy lines. The hind wings are lighter brown and without lines. The moths are about 1.5 to 2 inches long, but this is not usually the life stage that is noticed by growers. 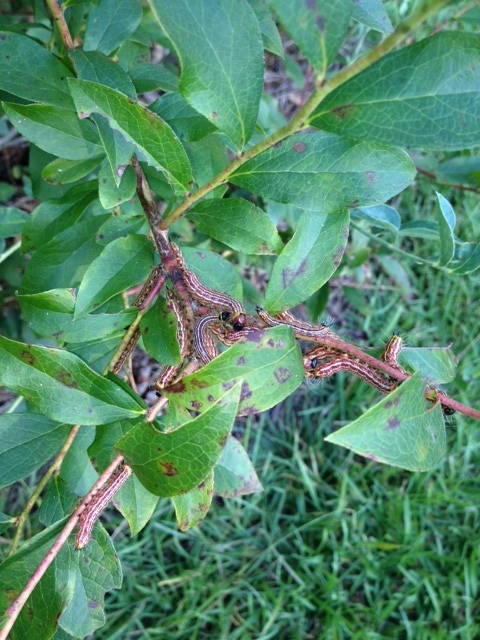 It is the larvae that cause significant defoliation to plants. Immature larvae are reddish-brown with narrow, cream colored lines that extend the length of the body. Mature larvae are black, about 2 inches long and are covered with long, white or grayish hairs. The Walnut Caterpillar overwinters as a pupa in the soil. The moths emerge in the spring and deposit white eggs in masses on the underside of leaves. These eggs result in the larvae that form a compact mass. These caterpillars molt several times during development. The larvae feed in groups, but unlike fall webworms (also common on pecans) they do not form webs. They are capable of eating all the leaves on small trees or entire limbs of larger trees. 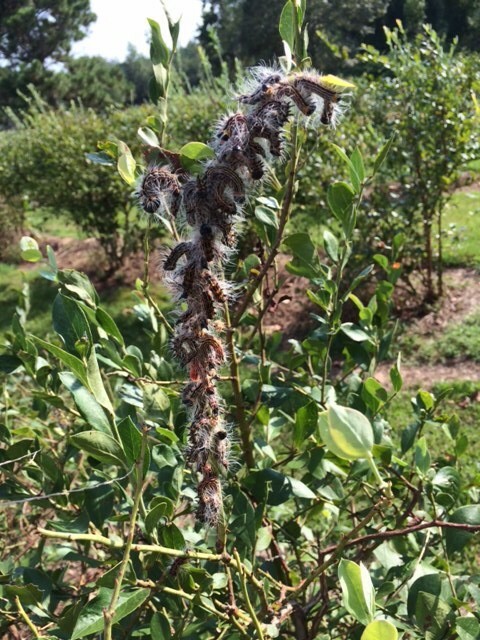 Although common on walnut and pecan trees, the realsurprise this year is that I have reports of them feeding on blueberries (see photos below). Above are three photos of the Walnut Caterpillar larvae. Below is the one photo of the resulting damage they can do. 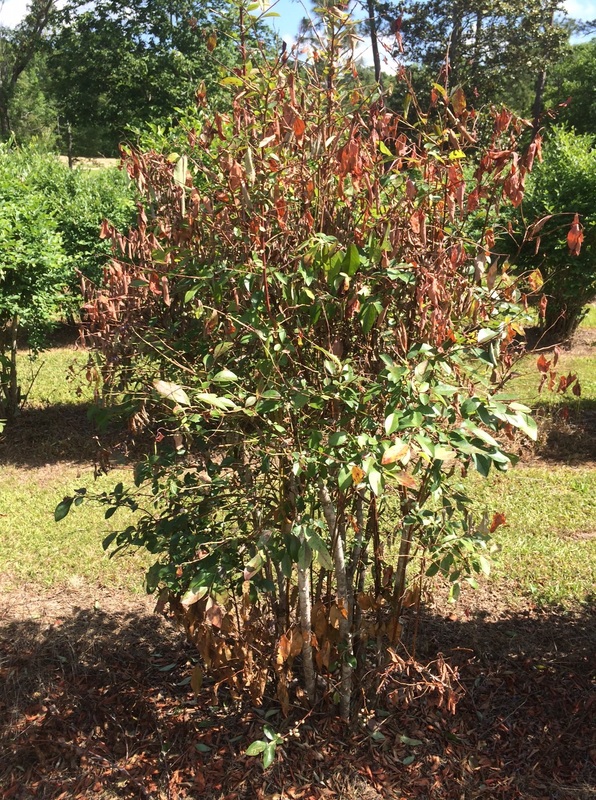 Significant defoliation can lead to poor winter hardiness and possible reduced fruitfulness next year. So, what to do about them? There are a few options: cut out the branches with worms; use products that contain Spinosad in them (like common Leafminer & Tent Caterpillar Spray); or spray with Sevin (this also kills beneficial insects though). 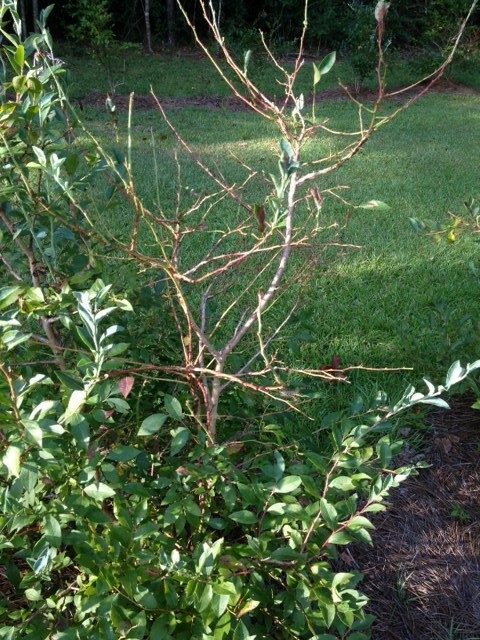 Most of the time the best option is the one to just remove the section of the plant with the larvae and dispose of it. Below are more links that cover this insect. 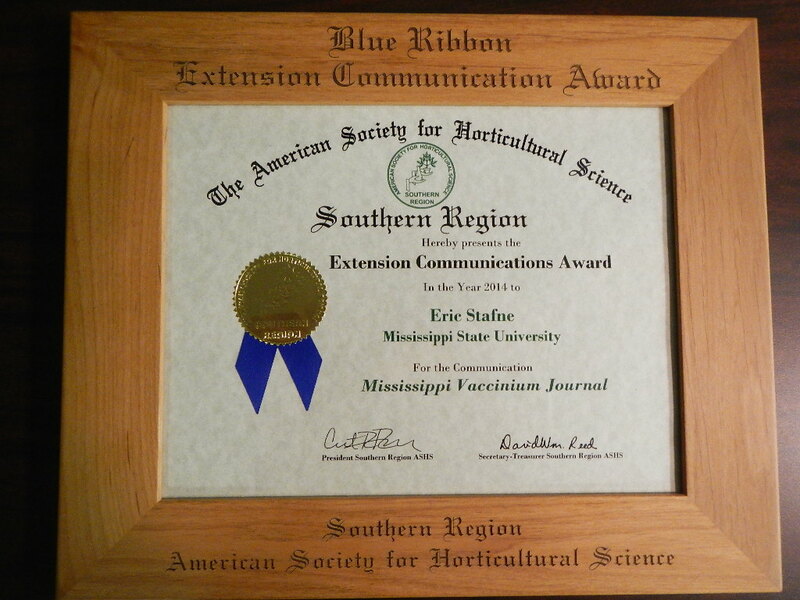 At the 2014 American Society for Horticultural Science, Southern Region meeting held in Dallas, TX the Mississippi Vaccinium Journal was given a Blue Ribbon Extension Communication Award (see below). This is a great honor as the chosen communications must show a high degree of quality. While I have received this award in the past, this is the first time I have gotten one for work I’ve done at Mississippi State University. The MSVJ is a newsletter written for blueberry growers. It is published quarterly and it goes out as a pdf file via email to: all MSU extension personnel, direct subscribers, and all Gulf South Blueberry Growers Association members. If you are interested in receiving the MSVJ there are a few ways to do that: one is to email me and ask to have me send it to you directly, two is to be a member of the GSBGA or work for MSU Extension, three is to access current and past issues from MSUcares at this link (http://msucares.com/newsletters/vaccinium/index.html), and four is to get it from this blog at this link where all new issues are uploaded. I am pleased to have received the award and I look forward to editing and writing it for as long as it continues to be read. 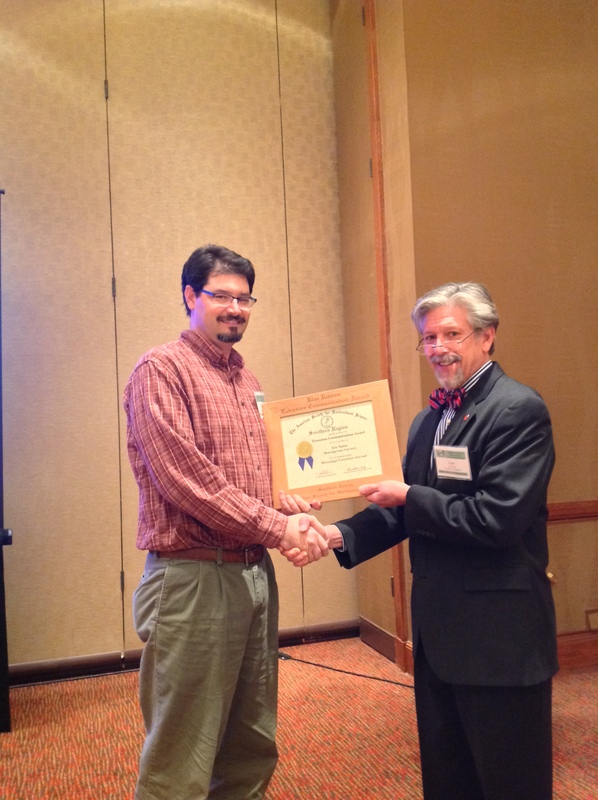 Special thanks goes to all the readers of the MSVJ, the USDA-ARS researchers in Poplarville who contribute content, and to Mike Neff, ASHS, for sending the image of me accepting the award. See images below about the award.